CeRDI together with the City of Ballarat have established a spatial mapping archive of Ballarat’s vibrant musical heritage. Launched on 6 September, SongWays Music Mapping is one of the latest discovery projects available through Historic Urban Landscape Ballarat (HUL Ballarat). The SongWays Music Mapping portal offers insights about the role of music and sound in Ballarat and the surrounding regions. It documents the richness and diversity of Ballarat’s musical heritage, which has earned Ballarat its reputation as a ‘music city’. The portal offers a unique mix of stories, visual memorabilia and brief videos that are mapped to some of Ballarat’s most iconic music-making sites. Currently the portal has music-making stories associated with key landmarks that include Ballarat’s bandstands, the Courthouse at the School of Mines Ballarat, the Bridge Mall Inn, and the Main Rd Precinct. 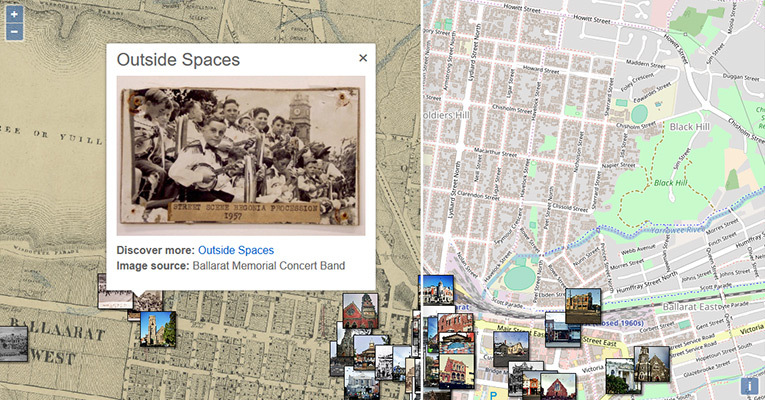 As a portal designed for community input, residents are encouraged to share their stories and memorabilia about music and space around Ballarat. Contributions can be uploaded via the website enabling these experiences and reflections to be shared, showcasing a unique perspective of Ballarat’s musical heritage. The CeRDI team have contributed widely to the development of HUL Ballarat, and more recently, the SongWays Music Mapping Portal, ensuring the development of an interactive web portal that engages the community and enables users to easily access authoritative and credible information.